Shilo’s curiosity, enthusiasm, and zest for the great outdoors parallels mine to a T. If I go sledding down a snowy hill, Shilo comes galloping after me. 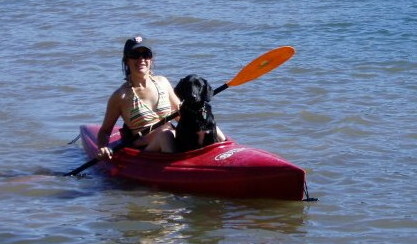 If I step onto a paddleboard, guess who’s right there with me, even though she’s brand new to the sport! Shilo is more than my co-pilot, she’s my fearless best friend. We have run races together, camped together and canyoneered together. 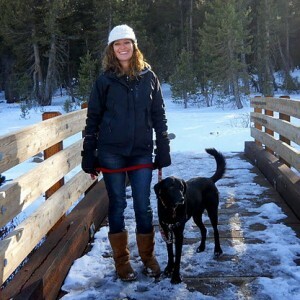 We have romped around Tahoe, Clear Lake, Yosemite, the Russian River Valley, and coastal areas between San Francisco and San Diego. Adventuring comes with occasional misadventures…. Among other things, Shilo and I have dealt with mechanical malfunctions, injuries, bites, and getting lost. But I tell you, when my clutch failed and I was stuck in unfamiliar territory, I was happy to have a companion to wait with me for the rescue and repair. 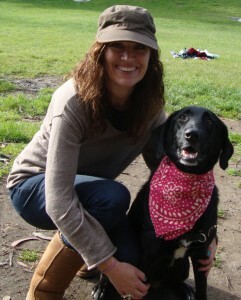 When Shilo sliced her carpal pad open tromping off trail through the forest, I was her nurse, wrapping the pad tightly with her bandana and getting her to the nearest hospital. Life wouldn’t be the same without my eager sidekick, and I’ll continue to venture the road less traveled with her as long as she’ll let me. Your generous contributions benefit the animals at Palo Alto Animal Services.